Twitter Question: How Can You Repair Broken Lipstick? Cosmo.ph beauty columnist Bianca Valerio offers some tips for salvaging broken makeup and creating DIY lip balm. Twitter question from @Ayzeerina: "How does one repair broken lipstick?... How do I 'glue' it back?" Great question! It's such a waste to just throw away broken pieces of makeup you can still use. In one episode of F.A.S.H., I discussed how you could be your own makeup artist by creating your own palette out of unused or broken makeup. For broken lipstick, in particular, if the tube is split in half, try to reattach both pieces by firmly pressing them together then sticking the tube in the freezer for a few minutes. The cool temperature will harden the waxes and oils for more stability. But, if your lipstick broke and left a big chunk in the actual tube, instead of throwing it away, you can scoop out the product with a mini spatula or any object that will fit (as long as it's well-sanitized with alcohol first). 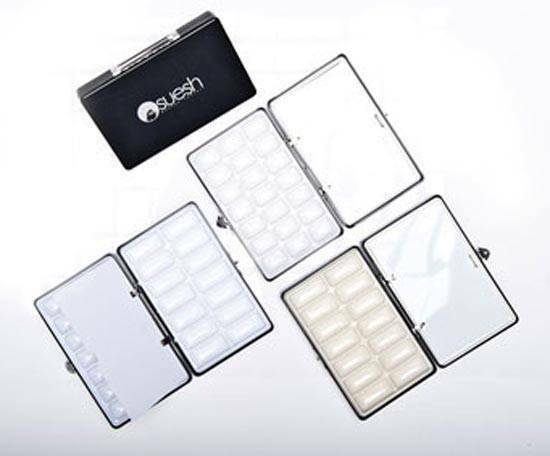 Place the product in a makeup palette or empty mini container. I recommend Suesh's 34-Well Makeup Palette (P1,500). You can create new shades with all the various shades you've collected in your makeup palette. Treat the lip color as you would lip balm and apply it with a lip brush for a cleaner application. Tip: You can mix the lipstick with a small amount of oil-based moisturizer to thin out its consistency, and you've just made yourself a new pot of DIY tinted lip balm! Thanks for the question! Send me more of your queries at @Bianca_Valerio or @cosmo_ph. It might be the one I choose to address next month!